Get with the program, sailor. We're gearing up for the reunion and want you to join us. Now's the time to join the Navy Musicians Association and register for the 2011 reunion. Who: All past and present U.S. Navy Musicians. - What: Navy Musicians Association 2011 Reunion. - When: Wed., June 22 through Sat., June 25. - Where: Holiday Inn Executive Center, 5655 Greenwich Road, Virginia Beach, VA.
- Why: Because you keep saying you'll come to a reunion someday, another year has passed, nobody's getting any younger and, really, how long do you expect us to play along with this hard-to-get jive? 2. Reserve a room at the Holiday Inn Executive Center. - Call the hotel at 757-499-4400 or 800-567-3856. 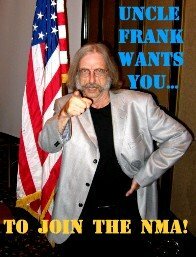 The hotel has blocked off rooms for us at a special rate, so mention that you're coming to the NMA reunion. - The special $99-per-night rate is also good for the 3 days before and after the reunion. - Do this soon to ensure the special rate. The problem: Sporting events that open with insulting renditions of the United States National Anthem performed by talentless pop "singers" whose self-aggrandizing vocal gymnastics destroy the dignity of the occasion. The solution: a Navy band. A reader from the US Navy Band informs me this is the USNB. As you can see in his/her comment below, a better video is available here.